Teaching first year students, I feel it's my job to make sure students leave my class with an understanding of where French is spoken. Naturally, this is one of the first things we discuss in my class, but if it's not reinforced, students often forget. While I love to talk about France and share my experiences there, it's important that my students understand that not all French speakers live in France. We are doing our students a strong disservice if we neglect to introduce them to the varied cultures of other francophone countries as well. 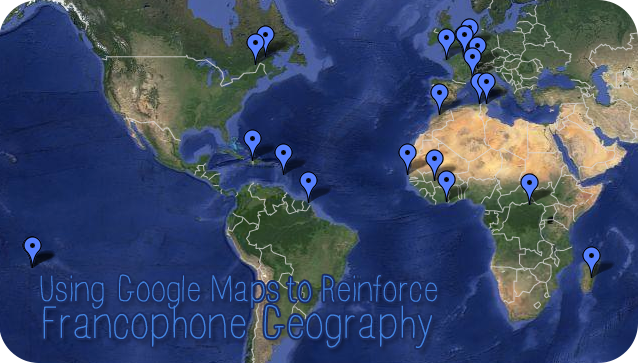 Last year I started using Google Maps and Flickr to embed culture and geography into some of my vocabulary-based lessons. For my first map, I searched Flickr for Creative Commons-licensed photos (photos that can be used on other sites without copyright infringement) of people in various francophone countries. I looked for specific information about what city the photo was taken in. I then placed the photos on the map where they were taken. When we viewed the map in class, students could see how spread out the pins were. We zoomed in on various pins and discussed the content of the photo in French (using expressions such as "C'est un garçon, il a cinq ans, il est de Dakar, il est sénégalais"). When we were learning about family members, I made another map with francophone families. I also made a map of impressionist artwork created in the francophone world and various climates and types of weather in the francophone world. This is a type of activity I like to do for about 6-7 minutes and then revisit the next day. Spending too long on this activity can be somewhat repetitive, but doing a little each day is a nice way to review vocabulary while also reinforcing geography and showing authentic images. Sometimes I have the students discuss the photos in groups instead of as a class to change things up. Below are the maps I have made so far. Feel free to use them in your classroom or copy them and adapt them to your use. They're really much easier to navigate if you click the link to open them in a new window. When you click on a placemark, a photo comes up. Some areas have lots of placemarks near each other, and you'll need to really zoom in to see them all. Qui est-ce ? (C'est une fille, une dame, etc.) Il/elle a quel âge ? (approximativement) Quelle est sa nationalité ? Il/elle est de quelle ville ? Qui est dans l'image ? (une mère, un père, etc.) Quel âge a le/la...(approximativement) ? Quelle est la date ? C'est quelle saison ? Quel temps fait-il ? Quelles sont les couleurs ? Qui est l'artiste ? Qui est dans l'image ? If you like my idea but want to create your own maps, it's fairly simple, but a little time consuming (the payoff is you can reuse these maps in future years). I recommend using images that have a Creative Commons license. This way you're not stealing the images; the photographer has put a license on them allowing you to use them if you give him/her credit. If you go to the Flickr Advanced Search, you can scroll all the way to the bottom and select "Only search within Creative Commons-licensed content." Then go to the top and type in your search. If I'm looking for a person in Sénégal, I might try the following searches: dame senegal, femme senegal, monsieur senegal, homme senegal, garçon senegal, boy senegal, fille senegal, girl senegal. Look in the description or the map info on the side to see if it says where it was taken so you can place it more accurately on the map (I tend to be a stickler for trying to make things precise!) 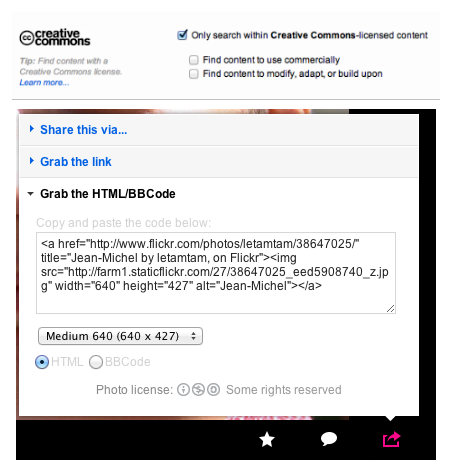 When you've found an image you want, click the share icon (see the photo above to see what it looks like), and click "Grab the html/BBCode" and copy the code. Next you have to make the map itself! First, you'll need a Google account. Once you've signed up, go to the Google Maps page, and click "My Places" and "Create Map." Click the place mark icon to put a place mark on the map where you want it. You'll need to click "Edit HTML" to place the photo in before saving the place mark. So there you have it! How do you reinforce geography in your French (or any language) class? This is so amazing its ridiculous! I love how you can see the points all over the map to show where French is spoken. Thank you so much for sharing! La rentrée, 2è partie - Pourquoi le français ?